I had never been quite pleased with my mineral photos taken through a Meiji EMZ-5TR scope. After reading the discussions about the Nikon CF Achromat finite 4X and 10X objectives, I decided to give them a try. this is the setup that I put together. It mounted on an aluminum extrusion the is just under a meter long and weighs 11 kg. The bench that it set on framed out of 2" x 6" lumber with a 1.75 inch thick top. With all that is stored in the bench, it weighs in close to 1000 pounds and sits in a concrete floor. As you can see, it was built for my radial arm saw. The stage has a fine and coarse Z axis adjustment, a Y axis adjustment, and a coarse X axis adjustment. The X axis rail is 250 mm so that I can use my pre digital age 105 Micro Nikkor to photograph larger specimens. The camera and objective are mounted to a PB-6 bellows on the coupling rail for joining the PB-6 extension to the PB-6. There is a RRS rail attached to the bellows rail and two RRS clamps on the Newport slide. The micrometer has a vernier that is capable of giving .001 mm increments. The aegirine posted in the technical and studio forum was my first attemp at using this setup. Your rig is exactly what I was talking about Doug when I said Oxford Scientific Films used to couple both camera and subject carrier together on a "lathe bed" type construction like a head and tail-stock, or optical bench, so even if it vibrated the camera and subject moved in unison and appeared static to each other. They were even able to photograph at quite high magnifications on a moving ship using this type of rig. In many set-up's I have seen here the subject stages and camera are divorced from each other and so can move independently, although many seem to get good images from them. However from an engineering standpoint it has to be more stable to link both together on a single or dual rail system so in the event of any movement they both move in unison. Now that looks like a pretty dang stable setup, I like! I suppose that aluminium extrusion and the mounting to it is 'bespoke'? I'm curious about a couple of points of nomenclature and operation. 1) You mention that "The X axis rail is 250 mm"", so I'm thinking that for you X is the direction of focus stepping, while Y and Z are across the film plane. 2) It appears to me that the camera sits on a long slide with a micrometer screw adjustment, while the specimen stage sits on some small positioning block also with a micrometer adjustment. Which one (or both) do you use for stacking, and how do you make that decision? No doubt there are others elsewhere atound the world. It's a bit expensive though as they seem to sell it in 8ft lengths but I don't know if there are any who would cut off a couple of feet for you. You are correct on your first point. The lowest piece under the camera is the Newport slide (X axis). This micrometer is capable of .001 mm increments and is the one I use for adjustment between shots. I prefer to move the camera as I feel this has less effect on the lighting then when the specimen is moved in relation to the lighting. The lower micrometer on the stage is the fine vertical adjustment (Z axis). It is a relic from use on the microscope and has 10 mm travel in .02 mm increments. The upper portion of the stage is a coarse Z adjustment to make it quicker to center different size specimens and has 40 mm travel. The center section has 40 mm of travel across the sensor plane for the Y axis. I added the 250 mm rail for use with my old 105 Micro Nikkor. This will allow me to modify the stage and photograph larger pieces. The movement on this rail is 18 mm per revolution of the knob. It also helps when changing out micro specimens as I can move the stage back to have more working room. I obtained the extrusion from an outfit in North Carolina. In addition to inch and metric extrusions and associated mounting hardware, they have a line of pneumatic and electric actuators and other items. I got my mounting hardware from Lowes, a big box home improvement store. I thought I had seen a reference to them somewhere on this site. I do not recall the name and I do not have the bookmark on this new computer. The camera end is secured to the extrusion using two barrel nuts and 1/4" - 20 socket head cap screws. The rail for the stage is secured with carpet tape as it does not line up with any of the slots and I wanted it in line with the camera mount. The rail is not permanently attached to the bench so I can move it without needing a fork lift or crane. Next month I will have it our local club show as I demonstrate there. The rail for the stage is secured with carpet tape as it does not line up with any of the slots and I wanted it in line with the camera mount. Now this is sounding like my kind of setup! But I've looked and looked and I can't find the carpet tape. Wait...I'm thinking duct tape. Carpet tape is double-sided, right? So it's sandwiched between the long X-axis rail and that massive aluminum bottom beam? Is that stuff strong enough to hold the rail on while you go for demo, or do you just strip it off and re-apply on-site? Doug, looks like a great setup. Thanks for sharing it--we all benefit when someone competent shows another way to skin a cat. I liked your aegirine, by the way--especially the way you used lighting to show the structure, surface, and color of the crystal. I know this is often quite a challenge with micro minerals. (snip) couple both camera and subject carrier together on a "lathe bed" type construction like a head and tail-stock, or optical bench, so even if it vibrated the camera and subject moved in unison and appeared static to each other. . . . In many set-up's I have seen here the subject stages and camera are divorced from each other and so can move independently, although many seem to get good images from them. However from an engineering standpoint it has to be more stable to link both together on a single or dual rail system so in the event of any movement they both move in unison. Dave, you may already be saying this, as you include an optical bench as an example of mechanical coupling. But I'd like to clarify that linking camera and subject stages on a rail system is not the only way to achieve effective mechanical coupling (which, I agree, minimizes a lot of potential problems.) My heavy steel Bratcam base couples camera and stage very well. I'll bet the folks using optical breadboards are getting much the same benefit. I imagine, but don't know, that those using granite slabs achieve solid mechanical coupling. And the folks using wood bases for this purpose seem to get good results (intuitively, I'd have guessed that wood would dampen a bit more, and couple a bit less, than metal or stone, but have no direct experience, and wood seems to do the job for those who use it). Then I got to thinking ................there are probably hundreds on the mini-type cross-cut set ups on dumps or unused..............most have a X-Y setting that might be utilised for Macro work? Might even be worth buying a new one.............use it as a saw...and...as a camera bed??? It might be worth pointing out that O S F were using cinefilm, where the apparent sharpness is considerably greater when viewed as a movie than it is in any individual frame. Thus, the ultimate test of the effect of such a rig on the effects of camera vibration is single-frame still photography without short-duration flash. Since this discussion has been re-opened, I'd like to go one step farther and clarify that camera-to-subject coupling is seldom either needed or achieved for anything except some types of external vibration. If you'd like to verify this with your own setups, try mounting a 10X objective, turning on Live View, and seeing how hard you have to touch something before the image shakes detectably. In my experience it's usually not much. The best I've seen for that test is with a DSLR hard-mounted to a microscope frame, in which case it's possible to tap gently on the frame with the soft parts of fingertips. However, that same setup makes fuzzy pictures if I shoot with continuous illumination and without electronic shutter. The reason is that the mechanical shutter vibration is being coupled unevenly to the objective and the subject, resulting in a micron or so shift in relative position. Maybe a micron doesn't sound like much, but it's more than a full pixel at 10X on an APS-C sized sensor. In all these discussions about stability, it's important to distinguish between vibrations coming from the outside environment and those originating within the equipment. External vibrations can be attacked very well with mass and stiffness, sometimes augmented by deliberately squishy supports. If the supports are squishy enough, you don't even need much mass. Charles Krebs successfully hand-held several deep stacks by using a jig that allowed a live horsefly to perch on an extension in front of his lens. This is clearly a case of adequate coupling between camera and subject. But the important vibrations in question were only what would get through his arms -- something around 1 cycle per second. Internally generated vibrations at high magnification are a lot tougher. This is partly because they're usually high frequency shock-type stuff like shutter slap, and partly because the source is significantly different distances away from different parts of the device. In the case of Doug's jig, or the BratCam, or any of my setups, the lens and the subject are many inches apart. Even in a microscope frame, the objective and the subject are about 6 inches of support apart, and the camera is twice as far from the subject as the objective is. As a result, when the camera vibrates, the objective feels it more than the subject does. That difference is visible. You can get a surprising amount of movement when your detection limit is 150,000 times smaller than your lever arm (1 micron versus 150 mm = 6 inches). That's why people who shoot at high magnification tend to use either flash or electronic shutter. If coupling were the answer, then people who use microscopes and DSLRs would just clamp them together and shoot away. They don't, because it doesn't work. Let me be clear that I'm not arguing against stability. Systems that flex less are easier to set up and easier to use. They are also less vulnerable to whatever external vibration you cannot isolate them from. And since stability often comes from firmly attaching things to big masses, a stable system will often have less trouble with internally generated shocks too. But it's important to keep all this in perspective. Certainly every stacking rig has to be stable enough to make sharp pictures. Beyond that point, any design aspects that would give even more stability but make the rig more limited or harder to handle are probably moving in the wrong direction. I agree completely with Dave's argument, within certain limits. It is more stable to link everything together, and if you want to film on a moving ship, you should definitely do that. On the other hand, if you don't need to film on a moving ship, then I'll suggest it's better to think about what you do need, and design accordingly. Life's about tradeoffs. So is engineering. I find it rather amusing that this discussion has been triggered by the picture of Doug's setup. It's a great setup -- I like it a lot. On the other hand, it's a classic camera-mover, with the subject stage held down by tape. The reason I like it is that I suspect it works really well for what Doug wants to do. I'm really not sure why Dave likes it, assuming he still does now that these aspects are clear. I agree Chris, but if possible linking camera and subject carrier to the rail or base as close to their centres of gravity as possible reduces vibration induced sway. I have seen some very tall rigs perched on small bases, like the one I linked to in the other post, that must amplify any vibrations the base receives through swaying. I suppose the design depends whether you move the camera or the subject as some are evidently trying now. But if you move the subject ideally the camera would be mounted direct to the rail to keep its centre of gravity as low as possible. That would be OK if you use extension tubes and can also keep the subject in the centre of the lens whilst providing all the movements required, but impossible if bellows are used which obviously raise the camera height. If you move the subject however, do you need bellows with a focusing slide? If not that too would allow closer mounting of the camera to the rail. However most of the bellows we have do have inbuilt slides as well as the bellows length adjustment, so we are stuck with them. The problem of course is all the various slides for X, Y etc adjustment do add height to any rig and higher its centre of gravity. No problem for most, but could be at the very high magnifications some of you are working at. Regarding the cross cut saw bench SA. 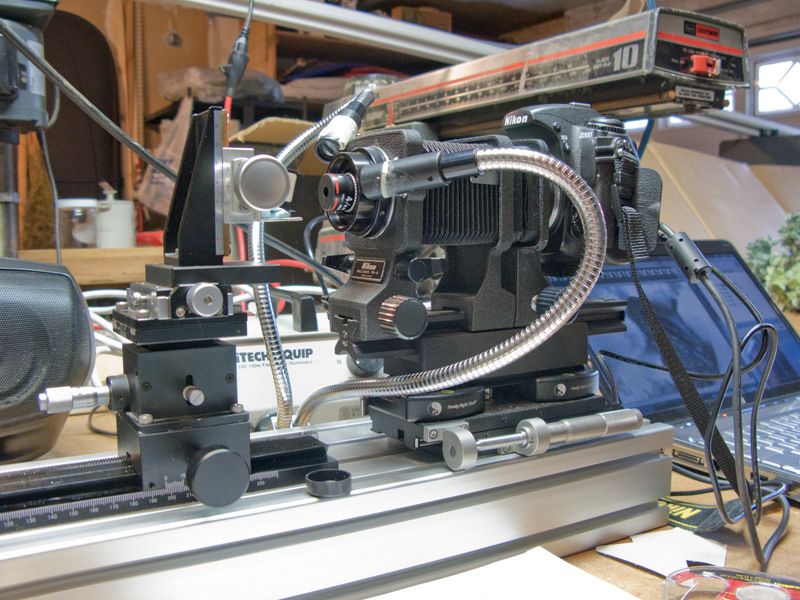 I did read years ago where a macro natural history film maker used one of those radial arm saw benches that Doug shows as a mounting for a cine camera in place of the saw unit. He claimed the heavy castings and ball bearing slides provided less vibration and smoother "zoom" motion than the much lighter rigs usually sold for photography. Pau, weight is an advantage for high magnification rather than lightness for portability since it produces inertia in the set-up, meaning it is harder for vibration to start it moving provided it is carried on vibration absorbing feet. Obviously though practicality determines what you can do. Just throwing ideas into the pot, that's all? Edit: Rik just posted before I did. As you say Rik things may not matter for the magnifications most work at, but some of you are now working at very high magnifications for the equipment used. I can only quote the equipment previously used for lens testing years ago by a firm in London (hardly a vibration and traffic free area) who claimed it was set up in their cellar on a very heavy cast vibration isolated concrete block. They claimed that many rigs then used were not stable enough to show the lenses actual potential. However whether laboratory lens tests have much relevance to actual photography where ideal conditions seldom exist is debatable, particularly when a lens is then hand held. However they probably are more relevant the higher the magnification. To quote my remark above before you posted "Obviously though practicality determines what you can do."